Seaside Inn is the only inn located directly on the shores of Kennebunk Beach where couples can enjoy lounging on the sands in the summer and take uncrowded walks during the spring, fall and winter. Seaside Inn is open year round, this family run/owned property dates back to the 1600s and is run by 9th generation family innkeepers! Couples may also find the outdoor hot tub a romantic touch while watching the ebb and flow of the waves meeting the shore. 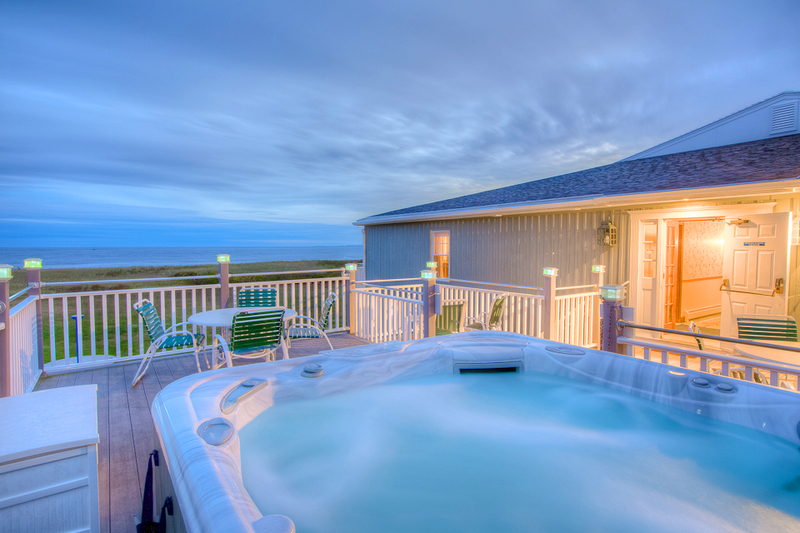 The wintertime can be especially romantic when couples may be lucky enough to enjoy the wintry beach landscape while watching the snow fall melt from the hot tub. The Seaside Inn is a very ideal location, having beachfront access as well as being a short walk from Kennebunkport’s downtown and ocean recreation charter. Just up the street from the inn is Kennebunk’s Lower Village where there is a variety of interesting boutique shops and dining from Mexican, Italian, tapas style, a wine bar, and Irish Pub, to fine dining at Maine’s only 5 star restaurant – The White Barn Inn. Just across the bridge from the Lower Village is Kennebunkport’s famed Dock Square, a quaint district where vacationers can browse or go on a shopping spree in the many art galleries and boutique stores. Dock Square is also a foodie’s delight with a great restaurant scene from Hurricane to Old Vines, Alissons, Stripers and The Boathouse. Seaside Inn also offers free bike rentals, so you can take scenic bike rides along Ocean Avenue or Parson’s Way, or visit the Lower Village and Dock Square without worrying about parking. For a romatnic BnB in Kennebunkport, The Captain Lord Mansion is the ultimate – with fireplaces and four poster canopy beds. Its luxe and lovely, overlooking the River Green on Ocean Ave. If pampering, spa treatments and a waterview are your kind of romance, then The Breakwater Inn and Spa is just the fit for you. Rooms overlook the River and the breakwater out to sea, the Seamark Spa is on premise with massages, facials, and beauty tratments, and Stripers is the on site restaurants with spectacular sunsets and delicious seafood and Maine fare. So make a memory at one of these romantic hotels in Kennebunkport!